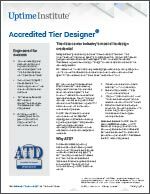 Abstract - The Accredited Tier Designer (ATD) is intended for professional engineers. The course material will address detailed issues on a level appropriate for experienced design professionals. This course is 3 days of intensive instruction focusing on materials and concepts of a technical nature. The curriculum crosses traditional engineering- discipline boundaries and culminates in an examination.